First things first–let’s look at where the show left off. 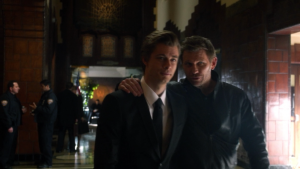 The season finale ends with John (Luke Mitchell, aka Lincoln from SHIELD), whose powers had been stripped away, regaining them with “help” from Jedikiah. Of course, that’s no act of generosity, as he intends to use John as the first of many new superpowered foot soldiers. Meanwhile, the Tomorrow People take over Ultra’s base for themselves and use it for their ever-growing ranks. 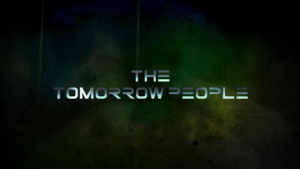 The Tomorrow People Season 2 would’ve started off with a time skip; how far exactly isn’t clear, but executive producer Phil Klemmer describes it, “Season 1 was very much a show about an adolescent hero dealing with adolescent issues, and Season 2 will be much more a show about adults.” That seems to imply it’d have jumped a few years, at least. He also compared it to a second pilot, so the show would have undergone some pretty radical retooling between seasons. No doubt this was a reaction to the declining ratings that got it canceled. One of the consequences of that time skip may have been lifting the veil on the whole concept of The Tomorrow People, such that the public is now aware of their existence. How do they deal with this, and what do they choose to do with their powers when hiding it isn’t required? Will they become a force for good or bad in this world? There are way more of them now, too. Klemmer also suggests that Russell’s character arc was something he really wanted to focus on next season. Given that Russell spends the majority of the finale trying to atone for his betrayal in the episode prior, it’s likely this redemption arc would’ve been key to the state of his character in season 2. In that article, he specifically mentions Russell taking over as the leader of the Tomorrow People, but doesn’t know “how.” Time skips are definitely one way to hide the “how” and worry about it later. If you read all these articles I’m linking, you’ll see Klemmer loved using the phrase “playing God” to describe Jedikiah’s actions in the finale; but there’s a way more obvious and literal instance of playing God that takes place: Stephen rewinding time to save Cara. The fallout of that would absolutely have to be addressed, especially given that Cara seems to possess some level of awareness of what happened. Does she actually remember dying, or is it just telepathically reading Stephen’s mind and getting that info from his perspective? Time skip might make dealing with that tricky, unless Cara’s in a really bad state at the start of season 2. I mean really, is granting superpowers as much playing God as REVIVING THE DEAD? Klemmer doesn’t seem to be a fan of social media, so there’s not much to be gleaned from those sources this time; that doesn’t leave us with too much aside from what’s above. What I’d say then is that since it’s a reboot, we might be able to look at the original for some clues as to where it could have gone. So keep in mind, this part is more speculative than definite. In the original series, the teleporting is referred to as “jaunting” and involves passing through hyperspace in a manner similar to how FTL is depicted in most sci-fi series. Getting stranded in hyperspace was a possibility, and potentially very dangerous, but the more interesting aspect is that hyperspace is a place without time, and one of the potential consequences of a jaunt going wrong was freezing or reversing the flow of time. It’s possible that Hyperspace would have been introduced in season 2 as a means of explaining how Stephen saved Cara. The Tomorrow People of the original series also gradually developed a few new powers, including healing abilities and the capacity to create illusions. These may or may not have shown up in later seasons, but had the show run long enough it’s practically guaranteed that new powers would appear. The original series also involves lots of alien influence, which probably wouldn’t have carried over into the reboot (especially since Jedikiah, in the original, is a robot built by aliens and that’s clearly not the case here). A more likely plot source is the telekinetic arms race that developed, presented in the 70’s series as an aspect of the Cold War; the Tomorrow People obviously present not only massive security risks between the mind reading and teleporting, but also potentially powerful weapons, if they can be controlled. And since that’s exactly the spot we see John left in by the end of season 1, this seems like a logical plot for The Tomorrow People Season 2. An element that blocked telepathic abilities called Balamin (or Barlumin, it’s not spelled consistently online) also existed in the original series. It may actually have already appeared in the reboot, in the form of the teleportation-resistant walls used in the Ultra base. A Kryptonite-like object for the Tomorrow People’s abilities also seems like a no-brainer to include at some point. Speaking of the original, they wanted to include some more actors from the original in the next season, in much the same way that, say, Battlestar Galactica and The Flash have included actors from the original casts. All in all, The Tomorrow People season 2 would’ve been a radical departure from the first, and there’s no way to ever really know if that would be a good thing. Given the state the show was in at the time it was canceled (ratings-wise), a big shakeup would’ve been mandatory, so at least in this case it was something the people behind it were happy and willing to do. Clearly the casting wasn’t the problem, given how everyone involved was a relative unknown at the time and most have gone on to bigger and better things (in addition to Mitchell on SHIELD, Stephen (Robbie Amell) and Cara (Peyton List) are still on CW with The Flash). Like so many other sci-fi shows, it looks like The Tomorrow People was canceled right as it found its footing. Would you have wanted to watch if The Tomorrow People Season 2 had shaped up like this? Or were you hoping the show would head in a different direction? Let me know in the comments. If you enjoyed this and want to know when the next show comes up, you can subscribe to the “What Could Have Been” RSS Feed here. And do feel free to share this article with any fan communities that might appreciate the info! If you have a suggestion for a show’s lost season to investigate, you can message me on Twitter @RetroPhaseShift.